The Internship Agreement is used to offer someone an internship and spells out the terms of the agreement such as responsibilities and compensation. This Internship Agreement (Non-Technical) is included in editable Word format that can be customized in Word or by using the included Wizard software. 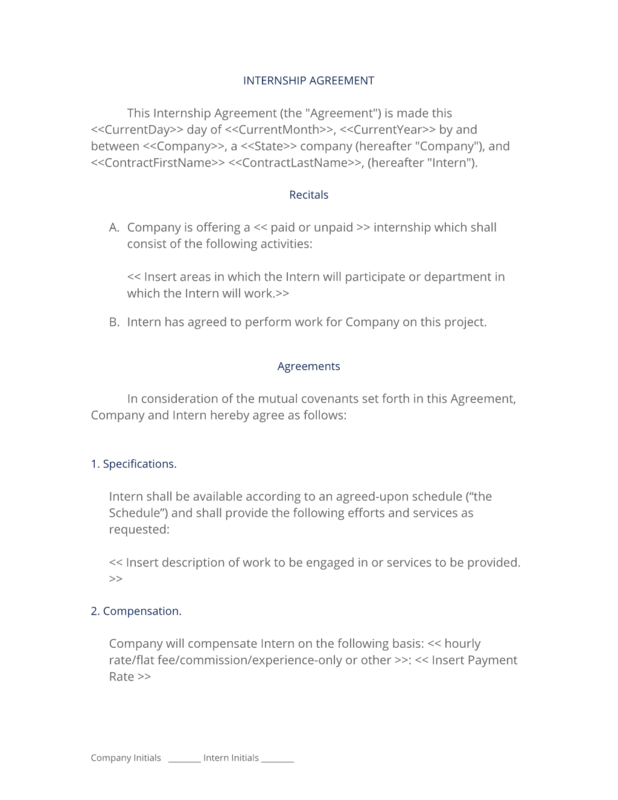 This Internship Agreement (the "Agreement") is made this Current Day day of Current Month, Current Year by and between Company Name, a State company (hereafter "Company"), and First Last, (hereafter "Intern"). Insert areas in which the Intern will participate or department in which the Intern will work. Intern has agreed to perform work for Company on this project. Insert description of work to be engaged in or services to be provided. Company will compensate Intern on the following basis: hourly rate/flat fee/commission/experience-only or other: Payment Rate. Intern will submit written, signed reports of the time spent performing services under this Agreement, itemizing in reasonable detail the date on which services were performed, the number of hours spent on such date, and a brief description of the services rendered. If college credit, then insert obligations and accounting responsibilities and timeline(s) for all parties. Keep a weekly journal of accomplishments. Company will receive reports no less than once per month on or before the Payment Day day of each month, and the total amount of work will not exceed Maximum Amount. Company shall pay Intern all amounts due within 30 days after such reports are received. College Credit or Obligations of Company to Universities or other Learning Institutions. All requests for college credit or other certification must be presented to Company prior to the beginning of internship and are subject to Company approval. Nothing herein shall be construed to create an employer-employee relationship between the parties. The consideration set forth above shall be the sole payment due to Intern for services rendered. It is understood that Company will not withhold any amounts for payment of taxes from the compensation of Intern and that Intern will be solely responsible to pay all applicable taxes from said payment, including payments owed to Intern's employees and subagents. Intern shall provide proof of Insert Insurance Requirements here. Intern shall be covered by insurance coverage provided. Interns would not be expected to carry liability insurance like a subcontractor would; however, issues of Workers Compensation should be addressed in this section. All work will be done in a competent manner in accordance with applicable standards of the profession. Intern shall make no representations, warranties or commitments binding Company without Company's prior written consent. In the course of performing services, the parties recognize that Intern may come in contact with or become familiar with information which Company or its clients may consider confidential. This information may include, but is not limited to, information pertaining to design methods, pricing information, or work methods of Company, as well as information provided by clients of Company for inclusion in work to be developed for clients, which may be of value to competitors of Company or to its clients. Intern agrees to keep all such information confidential and not to discuss any of it with anyone other than appropriate Company personnel or their delegates. The parties agree that in the event of a breach of this Agreement, damages may be difficult to ascertain or prove. The parties therefore agree that if Intern breaches this Agreement, Company shall be entitled to seek relief from a court of competent jurisdiction, including injunctive relief, and shall be entitled to an award of liquidated damages in the amount of Liquidation Dollar Amount. This Agreement shall be binding upon and shall inure to the benefit of Company and to Company's successors and assigns. Nothing in this Agreement shall be construed to permit the assignment by Intern of any rights or obligations hereunder to any third party without Company's prior written consent. If any portion of this Agreement is declared unenforceable, that portion shall be construed to give it the maximum effect possible, and the remainder of this Agreement shall continue in full force and effect. The complete Internship Agreement (Non-Technical) - with the actual formatting and layout - is available in this Contract Pack.